In this interview, Doug McCoy explains how the Coca-Cola bottle got its distinctive contour shape and charts the evolution of the brand’s packaging over its more than 100-year history. McCoy also offers tips on how to find old dumpsites that might contain Coca-Cola treasures, and explains the story of the rare 8-ounce bottle that sold in Lexington, North Carolina during the 1960s. To learn more about McCoy, visit his blog at cocacolabottleman.wordpress.com or check out his book, “The Coca-Cola Bottle”. My grandfather got me started collecting bottles when I was about eight years old. A couple of years later, I was walking along a creek and saw a bottle sticking out of a sandbar in the water. I couldn’t get to it to tell what kind of bottle it was. So I ran all the way home and dragged my dad there to get it for me. It was a 6.5-ounce Coca-Cola bottle from about 1948. I was fascinated by it because I’d never seen the design before. When I was a kid, they sold painted applied color label (ACL) bottles in the stores, not embossed bottles like this one. It had the city and state marking at the bottom. I wanted to know more about it. That began my interest in Coca-Cola bottles. I’d bring home just about any kind of unusual bottle, but my collecting became more focused over the years. In my teens, I packed away all my bottles and forgot about them. Years later, when I was cleaning out my parents’ attic and I came across all the bottles, I went through each box to see what I had. I’ve been collecting ever since. In the 1990s I decided to collect every type of returnable bottle that Coca-Cola had used in the U.S. going back to the 1890s. Back before disposable bottles, you’d pay a deposit on the bottle when you bought a soft drink. You’d take it home and then take the empty bottle back with you the next time you went to the grocery store. They’d give you back your deposit. The grocery store would return the bottle to the bottler, where they’d clean it, wash it, refill it, cap it, and send it back out to the stores. The reason why returnable bottles persisted until the 1990s is because some of the established smaller bottlers didn’t want to change their equipment. To go from returnable glass bottles to no-deposit bottles required new filling and capping equipment. Some of them didn’t have the money to make the transition. So they continued using returnable bottles until about the 1990s, when they were finally forced to go to no-deposit bottles. Collectors Weekly: Have you always focused on returnable bottles? McCoy: That’s pretty much what I collect, although I do have some no-deposit, no-return bottles. Coca-cola experimented with them in the ’60s, and then quit using them until they brought them back in a few areas in the ’70s. I don’t really collect them per se, but if I find an unusual one, I’ll usually take it home with me. The first no-deposit, no-return bottles were used before recycling was really big. People just threw them away. They’re hard to find now because they were made of very thin glass. They’d break easily. They’ve only recently become popular with collectors. The styles of those bottles changed a lot, so there are a lot of variations to collect. Not all of the early Coca-Cola no-deposit, no-return bottles had a contour shape. Bottle manufacturers couldn’t do it because the glass was so thin. They used an embossed diamond-shaped label that said “Coca-Cola.” The outline of the contour bottle was also embossed on that bottle. Those are pretty popular. There was also a paper-label no-deposit, no-return bottle that had a red-and-white-checkered pattern with Coca-Cola logos on it. Those are very hard to find with the paper label still intact. They sell for a couple hundred dollars, or more. Collectors Weekly: Where do you find the bottles you collect? McCoy: There are still places in the woods near my house where I dig them up. I’ve gone through that area a lot, digging and finding bottles and various things. Bottles also show up on eBay, and I go to antique bottle shows. The Coca-Cola Collectors Club is also a great place to find bottles. We have conventions and get-togethers. Collectors Weekly: Do people usually specialize in a specific type of bottle? McCoy: Some people collect only the very early Coca-Cola bottles, or the straight-sided bottles that were used in the early 1900s. Other people go for the five styles of embossed contour bottles. I collect both the embossed and ACL bottles. With the ACL bottles, the Coca-Cola and Coke logos were actually baked onto the glass. Those came out in 1955 and were used until the ’90s. Like the embossed bottles, they changed a little every few years. In the 1970s, they came out with an ACL bottle that had a red background and Coca-Cola written in white. Through the years there were slight changes to the wording underneath the logo. “Coca-Cola” stayed the same, but there were differences on whether it said, “trademark,” or whether it had the bottle patent date. The classic, 6.5-ounce return-for-deposit, ACL Coca-Cola bottle. McCoy: Sure. Like I said, I’d decided to try to collect every type of returnable bottle ever made in the U.S. Collectors had already categorized most of them, like the straight-sided bottles or the five embossed ones, but nothing much had been done with the applied color label bottles. When I decided to collect the ACLs, I needed to catalog my collection so that I could communicate what I was looking for to other collectors. The book started out as a quick-reference guide that I used myself. I gave copies to members of my family because they would go out and find bottles for me. Somebody from the Coca-Cola Club also asked me for a copy and then encouraged me to expand it into a book. I started working on the book in 2002. Phil Mooney, the head of Coca-Cola’s archives, was very helpful when I went there. He let me look through some of the records, and I found a lot of great information on these bottles. The book is like two books in one. The first part is the history of the bottles and an explanation of why they were created. The second part is the quick-reference guide with photographs of the bottles, the years they were made, and the sizes. Collectors Weekly: When were the bottles introduced? McCoy: The earliest Coca-Cola bottle was the Hutchinson Stopper bottle. Those were used from 1894 into the early 1900s. The straight-sided bottle came after that and was used from the early 1900s to about 1916. The next ones to come along were the five embossed bottles. Those were the first contour-shaped bottles, what’s come to be known as “the Coke bottle.” The first one of those was a 1915 patent bottle. The next one was the Christmas bottle that was used from 1927 to 1938. The Patent D bottle was used from 1938 to 1951. The 6-ounce U.S. Patent Office bottle was in use from 1951 to 1958. The 6.5-ounce U.S. Patent bottle, an embossed bottle, was around from 1957 to 1967. The first ACL bottle, which was called the transition bottle, was used from 1955 to ’61. Next was the 1961 ACL bottle, which was used until ’63. The ’63 ACL was used until 1965, the ’65 ACL until 1968, and the ’68 ACL was used into the ’90s. There was also a 1972 ACL bottle, with a red and white label, that was also used up to the 1990s. Collectors Weekly: How was Coca-Cola first bottled? McCoy: The Hutchinson bottle came out in the 1870s. A lot of companies used that type of bottle, not just soda people. It was the only halfway decent stopper out at the time. Joseph Biedenharn, who ran a candy store in Vicksburg, Mississippi, was one of the first to use the Hutchinson Stopper bottle for his sodas, including Coke. He wasn’t authorized to do that by Coca-Cola, but he saw that by bottling the drinks, he could take them to parties and picnics. There were others in Georgia who used the Hutchinson bottle. 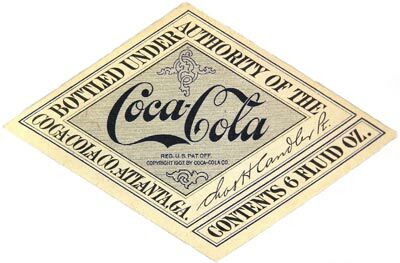 Then in 1899, Chattanooga, Tennessee, became the site of the first Coca-Cola bottling company. They used specially ordered Hutchinson Stopper bottles with “Coca-Cola” embossed on them. Their other bottles were generic—you could put whatever drink you wanted into them and put a paper label on it. Collectors Weekly: Why did bottlers eventually move away from the Hutchinson? Coca-Cola was bottled in returnable Hutchinson bottles from 1894 to the early 1900s. McCoy: The Hutchinson bottle had issues. It had a wire stopper that you pushed down with your hand. If you put something heavy on top of the bottles when you were transporting them, they would pop open. Even sealed, the drinks would only be good for five or six days. So around 1900, the crown bottle cap was introduced. It’s the bottle cap with the lip on it that’s still used today. William Painter invented it. Soft drink bottlers immediately saw the benefit of this type of cap because it had to be pried off of the bottles. That made a big difference in the bottling industry, not just for Coca-Cola. Coca-Cola bottlers stopped using the Hutchinson bottle and a lot of them switched to the crown-cap bottles. By this time, a lot of the bottlers had begun to use the straight-sided bottle. It became the bottle for soft drinks. As Coca-Cola started to take off, other companies like Koca-Nola and My Coca Company began imitating them. Their bottles looked very similar. Unsuspecting customers who thought they were picking up a Coke actually had some other brand. The Coca-Cola Company decided they needed to do something about it. That’s when they came up with the contour bottle. The Coca-Cola Company had a contest among several glass bottle manufacturing companies for a new design. They told the bottlers they wanted a distinctive design that would allow them to continue using their equipment for the straight-sided bottle. There were several candidates. But when Coca-Cola saw the contour shape, they knew it was the one. You could pick it up in the dark and know it was a Coca-Cola bottle. They patented it in 1915. Collectors Weekly: Did they make bottles in other shapes? McCoy: It’s pretty much been the contour shape since then. Even the 20-ounce plastic bottles now have an approximation of the contour shape. That was just their signature bottle shape. There are a couple of larger returnable bottles that they couldn’t do that with because of the size. They came out with a 64-ounce bottle in ’72 and a 2-liter in ’76. They tried to make them contour-shaped, but the bottles would end up breaking. So they only made them for a very short time. They made them in what they call a straight-wall design. As far back as the 1930s they also made special promotional bottles, but most of these were for in-house use. Such bottles might have been used as awards for a high-selling bottler or a salesman who had the best route. They also made special bottles just for employees. I think it was in the 1970s when they started making commemorative bottles for sports teams. They started making a lot of different commemorative bottles, such as Christmas bottles, because they realized there was a market for them. I don’t really collect commemorative bottles, but some people collect them exclusively. They still make them for different events, like the Olympics. The commemoratives are a popular area of bottle collecting. Collectors Weekly: What are some of the most rare bottles out there? McCoy: I’d say some of the Hutchinson bottles. They were only used for five or six years. Not that many were made to begin with, and the bottlers were still fairly small. When they started using the crown-cap bottles, they just took all the Hutchinsons to the dump. Early paper labels such as this diamond design are relatively rare. Hutchinson bottles were selling for as much as $4,000 a couple of years ago, but with the economy the way it is, I saw a very nice Hutchinson bottle from a plant in Birmingham, Alabama, sell for $1,700—the asking price had been $2,000. Hutchinsons are very hard to find. If you dig up one, they’re usually not in very good shape. Most collectors want a bottle that’s pristine. There were thousands of variations of the straight-sided bottles. Some were manufactured in small towns, so they didn’t make a lot of bottles for the area. Some of the more expensive straight-sided bottles probably sell for $200 to $300. I’ve seen some from very small towns go for as much as $1,000. By the time of the contour bottle, though, Coca-Cola was fairly well established, and a lot were made. Some of the early embossed-contour bottles came from small towns that no longer exist. Those are usually worth $75 or $100. Collectors Weekly: Did the manufacturers put their names on the bottles? McCoy: The actual bottle maker, or the glass manufacturing company, used a maker’s mark. The early bottles, like the Hutchinson bottles, just had a letter or two on them, not a specific logo. Some didn’t have any markings at all. With the straight-sided bottles, the manufacturer put marks in different places. It depended on the company. Some put them on the bottom, but most are toward the heel on the front part of the bottle. In the early years, they usually used letters like CHATT, which stood for Chattanooga Glass Company, and LGW, which stood for Laurens Glass Works. In the 1930s and ’40s, they created little logos for their company. Chattanooga Glass changed their logo from the four letters to a “C ” inside a circle. It looked like the copyright symbol. Owens-Illinois had a very similar looking logo. It was diamond-shaped with an “I” in the middle for “Illinois.” From 1915 on, there’s a maker’s mark somewhere on the bottle. Collectors Weekly: Did these companies manufacture more than just Coca-Cola bottles? McCoy: Glass companies had catalogues with every kind of bottle imaginable. You could buy generic bottles for aspirin, milk, ketchup—you name it. But the Coca-Cola design was patented. They wanted control over who was making their bottles. Coca-Cola inspected its bottle makers to ensure that they met certain specifications. They wanted the bottles to be very good quality glass. Most glass manufacturing companies made all kinds of bottles, but they had to be authorized as far as Coke bottles went. As I mentioned, Chattanooga Glass and Owens-Illinois were two prominent Coca-Cola bottlers. Root Glass Company out of Terre Haute, Indiana, was one of the biggest. They actually designed the contour bottle; they came up with the idea. So when Coke first started using that bottle, for a few years only the Root Glass Company made it. Of course the Root Glass Company couldn’t keep up with demand for the entire country, so they helped Coca-Cola by finding other manufacturers that could make the bottle. Collectors Weekly: Were there bottlers all over the country? Prior to its clear or green contour-shaped bottles, Coca-Cola sold its product in straight-sided bottles. McCoy: After the first one in Chattanooga in 1899, one appeared in Atlanta in 1900, and another in Alabama in 1902. Some of the bigger ones were on the West Coast, including one in Los Angeles that also started in 1902. That was a big year for new Coke bottlers. They opened up in major cities because of the larger customer base and because of the access to rail lines to get supplies and ship the product to outlying areas. They started with two bottling plants in 1900 and reached over 1,000 bottling plants by 1929. They spread into the smaller cities, too, but they’ve really scaled back in recent years. A lot of families bought Coca-Cola bottling franchises in the early days. Some of the bottlers in smaller towns started consolidating or closing by the 1970s. Coca-Cola Enterprises started buying up some of these bottlers in the 1980s. There are maybe 700 bottlers in the U.S. That’s down from upwards of 5,000 at the peak. They’re able to cover a much wider area with the trucks, trains, and large amount of Coke produced through automated systems. In the early days, the bottles were made here and shipped overseas. Now the Coca-Cola Company exports the syrup, and then the overseas bottlers add carbonated water, bottle it, and distribute it. Coca-Cola approves all the label designs and other aspects of the product overseas, too. These elements are written in the local language: Chinese, Thai, and Hebrew among many others. Collectors Weekly: Are those collectible as well? McCoy: Yes, very collectible. They started bottling Coca-Cola in Canada around 1904, using the straight-sided bottles. So those are sought after. There are thousands of varieties of foreign ACL bottles from the ’70s and ’80s. They’re very popular and collectible. Occasionally one will catch my eye, and I’ll get it. Collectors Weekly: Is a bottle’s rarity ever based on who manufactured it? McCoy: Sometimes. The city and state of the bottler is embossed on the bottom of the bottle. That can increase a bottle’s value. A lot of the molds were handmade, so there are also error bottles. They had to carve out everything backwards so that when it’s embossed in the glass, it will look correct to us. Sometimes the mold makers would get things backwards. Some early straight-sided bottles were clear; all were returnable. I live in Marietta, Georgia, and there’s a bottle where the “E” in “Marietta” is backwards. Marietta bottles are fairly common, but I always go through them to see if there’s one with the backwards E. I’ve found a couple. The glass manufacturing company usually destroyed error bottles before they got out of the factory. Coca-Cola had strict standards and didn’t want mistakes on those bottles. Bottles also show up every so often with paper labels, but you have to look closely because the label could have been reproduced. If the bottles were ever cooled in ice buckets, the label would come right off. Sometimes the bottling families will have leftover labels that were never used. It’s really hard to prove that a label is original. Regarding Hutchinson bottles, in most cases you can’t tell if it was a Coca-Cola bottle without the label. The ones that were used at the Biedenharn Candy Company are marked with “Biedenharn Candy Company, Vicksburg, Mississippi.” He did make other sodas and bottle them, but a lot of collectors say the bottles probably had Coca-Cola in them at one point. He would send out orange drinks in one order and when the bottles came back he’d wash off the labels, put a Coca-Cola label on the bottle, and send it back out again. The returnable bottles would be shipped out of the factory and then come back, get refilled, and get sent back out again. The Biedenharns are worth more money than ones with no embossing whatsoever because there’s no way to know where those came from or what was in them. Other companies used the Hutchinson bottle, not just soda companies. Collectors Weekly: Did Coca-Cola make different colored bottles? McCoy: They did on the very early bottles. The Hutchinson bottles came in clear or aqua. That was just because early bottle manufacturing processes weren’t that advanced. You have to mix certain sands and ingredients to come up with a bottle of a certain color. If it’s not mixed exactly the same, it may be a little different color each time you make a bottle. With the Hutchinson bottles and the straight-sided bottles, there’s a lot of variation in colors. Some bottlers wanted to use amber bottles, kind of a beer-bottle brown. They felt the labels showed up better on those bottles. But once Coca-Cola wanted a unique bottle, they specified that it needed to be Georgia green. There are some slight color variations in the 1915 contour bottles because the bottlers couldn’t always get the formula right for the exact color. But by the time they made the 1923 Christmas bottle, they pretty much had the color down pat. Collectors Weekly: Do they still make Georgia green glass bottles? McCoy: They do here. They’re 8-ounce, ACL labeled no-return bottles. They’re kind of the Georgia green color. They still use a lot of returnable bottles overseas. Some of those bottles are Georgia green. Some use just the clear bottle. It’s the contour shape, but it’s clear. Collectors Weekly: What’s the most common size of Coca-Cola bottle? McCoy: On average probably the 6.5-ounce size because they made that size for so long. They made it from 1915 to 1967. There are a lot of those out there. They didn’t start to make larger sizes until 1955. They made 10- and 12-ounce king-size bottles. They used the 10-ounce bottles in the southeast and the 12-ounce bottles in the north. There was also a 26-ounce bottle. They made an 8-ounce bottle for just one city in North Carolina. North Carolina is Pepsi territory, and Coca-Cola was trying to get its foot in the door there. So a bottler in Lexington, North Carolina, asked Coca-Cola to make an 8-ounce because the Pepsi bottler there had one that was selling for the same price as Coca-Cola’s 6.5-ounce bottle. That was in the 1960s. They used it for about 10 years. It’s one of the harder bottles to find because they only used it in that one little area. Collectors Weekly: How did bottling change Coca-Cola’s business? Some newer bottles have not lent themselves to the contour shape, such as these two-liter bottles, which are packed six to a crate. McCoy: Soft drinks were very popular when Coke came out. But very few of them were bottled. They were available from soda fountains, which were usually inside a drug store. Coke was seen as a seasonal drink, just for spring and summer. Asa Candler, the owner of Coca-Cola at the time, didn’t see a future in bottling Coke. He felt he was making enough money already. Three lawyers from Chattanooga felt differently. They asked Candler for a license to bottle Coca-Cola, and he agreed. Once it got going, it grew more than they probably ever imagined. They were able to distribute farther outside metropolitan areas. People just really enjoyed the drink. It increased their marketing area and sales. Coca-Cola sold the syrup to the bottling plants, and that also increased their revenue. Collectors Weekly: Was the public excited about soda in bottles from the beginning? McCoy: Yes, very much so. All of a sudden, people living out in the country had access to something they could formerly only get in the city. To spread the word, they sent out hundreds of coupons for a free bottle of Coca-Cola. You could take it to a local store and the bottler would reimburse the store. Samples were one of the main advertising methods. Painted signs were also used a lot. Then they started sponsoring the Olympics in the 1920s as a way to get their name out there. Collectors Weekly: When did the six-pack appear? McCoy: Six-packs didn’t come around until about the 1930s. Before that, bottles were shipped in wooden crates [see photo at top]. In the very early years, they were shipped by wagon. If you were a salesman, your sales area was as far as your wagon could go unless you had access to a train. Originally the salesmen were just selling to stores and restaurants, but I think they realized that the six-pack would work well in grocery stores because women usually did the shopping in those days. What woman’s going to want to haul 24 bottles out of the store? Also, people didn’t want to take that many bottles home. They really didn’t drink Coke like a lot of people do now. It was more of a treat. You might have it if you had company coming over. So the six-pack in the easy-to-carry cardboard box was perfect. 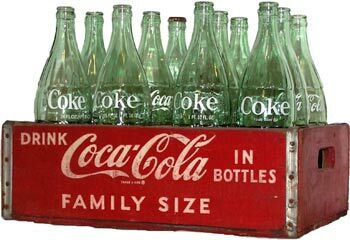 Collectors Weekly: What advice do you have for somebody new to collecting vintage Coca-Cola bottles? McCoy: I’d say do some research on the Internet or at a library. Read about the subject and try to get a feel for the value of the bottles. A lot of people get into bottle collecting and spend a substantial amount of money for a bottle that’s not worth what they just paid for it. I’ve really learned a lot from members of the Coca-Cola Collectors Club. You can find somebody who collects what you’re looking for and who will be able to give you all kinds of great information. There are also antique bottle clubs that you can find on the Internet and antique bottle shows all across the U.S.
Collectors Weekly: What are some of your favorite bottles in your collection? McCoy: Some of my favorites are the error bottles. I have one with an upside-down Coca-Cola logo. People who worked the nightshift would make bottles incorrectly and sneak them out of the factory. Some of those have made their way onto eBay. You can also find some with incorrect colors. I really enjoy trying to find different variations of those bottles. Some of my other favorites are the bottles with the red and white labels that they used in the 1970s. They’re very eye-catching and make a great display. Collectors Weekly: Did they make bottles in wrong colors? McCoy: Not completely wrong. For example, some of the error bottles are in 7-Up green—a lime-green colored glass—rather than Georgia green, or maybe a very light shade of amber. What would happen is that employees at a glass manufacturing company were probably making similar green-glass bottles and decided to run a few through using the Coca-Cola bottle mold. The glass manufacturing companies frowned on that, but sometimes the people who worked in the factories would take these deliberate errors home and display them. Some of them made their way into collectors’ hands. Collectors Weekly: Do you have any memorable digging or collecting adventures you’d care to share? McCoy: One time in the early ’90s I went digging for bottles in the Atlanta area. They had just started to do a lot of construction work for the 1996 Olympics. They were tearing down a lot of old buildings, some of which had been built on top of trash dumps. I knew there’d be a lot of old bottles in those places, but getting permission to dig was very hard. The color of an embossed Coca-Cola bottle is known as Georgia Green. A friend of mine, who’s also a bottle collector, was working for an engineering firm that was taking core samples out of the ground for building purposes. He asked me if I’d like to help him with that job part-time. So we got access to a lot of the construction areas. We found a lot of great bottles in the older dumps, like some rare Coca-Cola bottles from the early 1900s. A lot of different variations were made for the Atlanta bottler. Every weekend for four or five months, I got to go digging for bottles. Of course, the condition is an issue with bottles that are dug up. In the south, the soil is a little acidic so the bottles come out with a frosted, iridescent look to them. They can be cleaned off with a bottle tumbler, which is like a rock tumbler. It removes a very thin layer of the glass and the frosted part from the bottle. You sometimes find bottles down here that aren’t heavily frosted like that. By contrast, up in Ohio, Illinois, and Indiana, you can dig up a bottle and it will look brand new after you wash it. It just comes down to the type of soil the bottle is buried in. Of course, you find a lot of chipped, cracked, or broken bottles, too. Finding these places is really just blind luck sometimes. It also comes down to imagining where people will throw their trash if they’re out fishing or something. Are they going to go to the nearest trashcan, or are they just going to toss it off into a ditch near the lake? Over the years, I’ve learned to judge from the terrain where people are likely to dump bottles. Libraries and universities usually have some older maps of the cities and particular areas or counties. A lot of the old county maps will show where a particular dumpsite used to be. Then you have to match that map with a modern map to figure out where that area is now. If it’s not developed, you can find out who owns the property and get permission to dig. Tell me what is the current going price for a 8oz Coca-Cola Casey’s General Stores 25th Anniversary bottle. They were only issued to employees of the company. I have 32 bottles un open 6.5 oz anyone want them? My Dad, who is 82 years old, hand-carved the molds for glass coca cola bottles from the mid-1950’s until Chattanooga Glass Co. was sold to Anchor Hocking. I just now discovered this website and couldn’t resist asking you some questions that I haven’t so far been able to find answers to after having done a lot of research. I have a Family Size Coke crate that is marked “6-55 Perry, FL.” It has three dividers that make spaces for eight bottles. The wooden end pieces both have the full word “Coke” centered and written on them but they both only have part of the word “Have” from the words “Have a Coke” (not centered) on them. On the inside bottom of the crate there are eight dark colored circles, apparently left by the eight bottles it held. All the crates of this vintage that I’ve seen so far have more dividers and allow for 12 bottles and each bottle space is completely enclosed by the crate sides and the dividers (whereas in mine no divider would separate the bottles on one side.) Also, these other crates have on their wooden end pieces the full words “Have a Coke” centered and written on them. I later bought a Family Size Coke bottle dated “9-56” that has the ACL “Coca Cola” in white letters on two sides and is embossed with “1PT 10 FL. OZS” on one side. However, I’ve read that ACL on Coke bottles did not start until 1957 and this has raised a question in my mind. When I insert my 1956 bottle into my crate I see that two of these bottles appear to not fit across from each other, as the spaces are not large enough. My first thought was that may be the diameter of the 1955 bottles is somewhat smaller than this bottle. In this regard, I recall having seen a 1955 Family Size bottle that appeared to not have identical features as the 1956 one but I don’t recall the difference(s) and I haven’t been able to examine another 1955 bottle or find any measurements to make a comparison. My next thought was that may be the crate I have has been modified by a collector and is not authentic. I have a 1955 12oz Coke bottle that is not ACL. This makes me wonder whether that the 1955 Family Size bottle also would not be ACL? Is the 1955 Family Size Coke bottle smaller in diameter than the 1956 bottle? If so, what is the base diameter and the other dimensions of each bottle ? Is the 1955 Family Size Coke bottle ACL? Does it appear that my 9-56 ACL Family Size Coke bottle with ACL is authentic? What is the correct date that ACL on Family Size bottles started? Does it appear that my 6-55 Family Size Coke crate is authentic? I see that Coke made a cardboard carrier specifically for 2 Family Size bottles. I thought that may be these carriers were put into a crate like mine and that’s why it has fewer dividers. 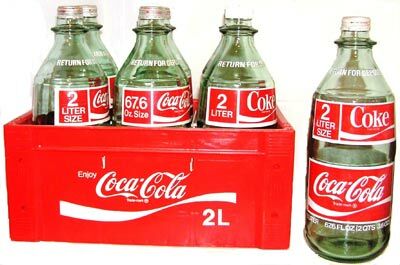 As an aside I also am wondering if this carrier was first packed with the bottles and then inserted into the crate for delivery, or, was the retailer, or the Coke delivery person, responsible for removing the bottles from the crate and then inserting them into these carriers? I hope I haven’t gone too overboard with my questions and I look forward to hearing your thoughts. “ ” When you play a large-scale symphonic piece, that's where the rubber meets the road.